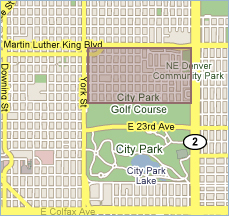 The Skyland Denver neighborhood is located just to the north of the City Park neighborhood, west of Park Hill and east of the city center in an area identified as Denver North East. The Skyland Denver neighborhood is northwest of downtown and occupies the top corner of Denver County. Bordered on the south by I-25, the west by Jefferson County, the east by Federal Boulevard and the north by Adams County, Skyland is a modest neighborhood that’s relatively tucked away. Architecturally, the neighborhood varies from thick-columned bungalows in the west to brick ranches and shotguns in the east. Overall, the area is held pretty close to the earth by the 1- or 1½ -story single family homes, bungalow duplexes and ranch-style apartment buildings. Mixed with these are taller Victorians, rows of classic Tudors and flat-roofed row houses. Despite the prevalence of mature trees, Skyland real estate has a very open feel with big front yards and wide swaths of grass between the sidewalk and the street. Homes in Skyland are listed with the zip code of 80205. Bordering the northern end of City Park, the Skyland Denver neighborhood has direct access to the 320-acre park with its two lakes, the Denver Zoo, the Denver Museum of Nature and Science, large wood-and-sand playground, tennis courts and sporting fields. For PGA-minded folks, the City Park Golf Course is only a 9-iron swing away. Although there’s no distinct commercial district, there are a few privately-owned food marts for simple bread-and-milk shopping needs, a barber shop and a soon-to-be-renovated retail spot on the corner of 28th and Madison. For all other creature comforts, the Skyland neighborhood is within close proximity to everything from Colorado Boulevard with its fast food fare to the eclectic “restaurant row” on 17th Avenue in Uptown. Also, a short trip south on either York or Colorado leads to Colfax Avenue with everything from small music venues to independently-owned bookstores and trendy bars. Colorado and York are both major thoroughfares leading to I-70.